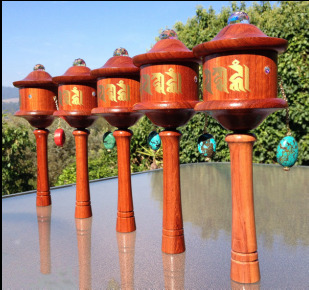 Click on the size to see dimensions for each handheld prayer wheel. Decorated with formal Tibetan syllables for “Om Mani Padme Hung” wrap around the cylinder of the prayer wheel with inlaid Swarovski lead crystals between. Spun into action by means of a turquoise or coral counter weight. Includes stainless steel lifetime bearings to ensure smooth turning. The Mani mantra was written by His Holiness the Dalai Lama. The life tree mantra and the earth and sky mandalas inside the prayer wheel were hand-drawn by Lama Zopa Rinpoche. To inquire about or order a prayer wheel, please visit our Order page. You may include other mantras in your prayer wheel. For a list of other mantras available, please visit that page. Please note: The number of mantras listed in the table are for a prayer wheel that only contains Mani mantras. If you would like to include other mantras in your prayer wheel, the prayer wheel will contain the same amount of microfilm but there will be fewer total mantras because only the Mani mantra was reduced very small.